Prepaid Text Messaging is very easy to learn and is much cheaper than talking if you want to communicate with a Prepaid Cell phone. You can get Unlimited Texting with the Verizon Prepaid Phones. You can purchase any of the Verizon prepaid phones. If you want to text to any cell phone it will be $20 per month. If you only want to text to other Verizon phones it can be done for $10 a month. You will have to sign up for one of the Verizon prepaid plans. You will be able to make phone calls also but the plans are expensive per minute. Go Phone has an unlimited texting option for $19.99 per month. This allows for unlimited texts to any cell phone user. Purchase a Go phone and activate it on the basic plan. After you activate it you can change to Unlimited Texting by either going to your Go Phone Control Panel or by going to Go Phone customer service. What does it cost for Prepaid Text Messaging? Most Pay as You Go Prepaid phones charge 1/2 unit or 5 Cents per Text Message, some are as high as 20 cents each depending on the plan you are using. Tracfone charges .3 units to send and receive. Net10 charges .5 units to send and receive except for their phones with Qwerty keyboards. The Net10 phones with Qwerty keyboards charge .3 units to send and to receive texts. 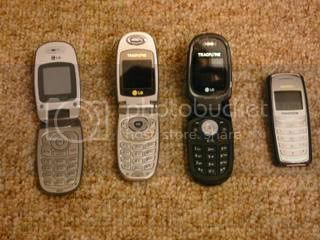 All of the digital Prepaid Cell phones are useable for Texting. The Lg200c, Lg 3280, Lg GC225 Camera phone, and the Nokia 2126. The nicest part of texting is you can respond at your convenience and you get a chance to think before you respond. I have often said things in a conversation that I wish I had not said. I often text with my girlfriend instead of talk---keeps me out of hot water sometimes. How Prepaid Text Messaging works. Normal Text mode--With normal texting you put in each individual letter. To put in a "Cat" you push the "2" key three times,wait for the curser to move to the blank space, then push the "2" key once, then push the "8" key once. To put in a space you then push the "#" Key. Most phones have Itap or T9 word which are predictive text input software. This makes it much simpler and Very fast to text. In Itap mode on my phone to type "Cat" you push #2,#2,#8 then select. It uses a little computer program to guess what word you want. It will show your options lower in the window. This is how all the kids in high school can text message each without even looking at the keyboard. This method of texting is much faster than using the Blackberry keyboard for most people and you can easily Text with only one hand on the phone. If you have a problem learning to text find a teenager and they can set you up quickly. Cricket offers Free unlimited Texting on all of their plans. The New Alltel U Prepaid offers unlimited texting on a couple of their plans. This plan is $45 per month and also comes with Unlimted calling, and unlimited data. Straight Talk Wireless is a partnership of Walmart, Tracfone and Verizon Wireless. You can get more information at Straight Talk.com. You can get the Alltel U Prepaid 75 cents per day plan and choose the unlimited text option. You will still have another of the 4 options available to choose. This is an outstanding plan. Alltel Prepaid has some of the best phones available for prepaid and America's Largest network. All tel's Contract service "My Circle" is a really nice feature also. With all Cricket plans you get unlimited texting. Cricket Mobile plans start at $35 per month. This is a great deal for a prepaid plan. Cricket prepaid is only available in a few areas. If Cricket is available in your area this is a great wireless plan. Cricket Coverage Maps - Check and see if Cricket is available in your city. The Boost Premium plan is $49.95 per month and offers unlimited Text Messaging, also Walkie Talkie service to Nextel customers, Unlimited nights and weekends and Wireless web access. is a great option for some people. My son uses text way more than he uses his phone. Many kids text thousands of messages a month. Yes thousands so if you can get a plan with unlimited texting they will use it. Why are so many Kids and Executives Addicted to Texting? There are several advantage to Texting. Texting is much quicker than talking on the phone. You can be texting several people at once. You can answer immediately or you can answer after you think about it or you can forget it. If you have free texting you don't use your minutes. It is funny that the Blackberry for Executives and text messaging for the students have come to dominate communications. Prepaid Text Messaging is a great way to stay connected and not spend a lot. Buy the latest Motorola W370 cell phone from Tracfone andk get Double Minutes for Life. This Straight Talk Wireless Prepay plan offers unlimited minutes, Unlimited Text Messaging and unlimited data for $45 per thirty days. Should you Quit your Cell Phone Contract?